This set has been long awaited - much discussed and lauded in the rec.music.classical.records newsgroup. The LPs of the symphonies were originally issued individually during the 1960s. They were a fixture of the late 1960s when Sibelius's standing was still struggling out of the slough of post-mortem neglect. An EMI boxed set (LPs of course) was available for much of the 1970s although it was not as comprehensive as the present set. Begging letters to EMI requesting CD transfer met with seeming indifference. Isolated reissues occurred as part of other series (Phoenixa for some of the smaller pieces, Symphony 2 on EMI Eminence) but the whole sequence seemed destined to remain on increasingly distressed vinyl. Of course the self-helpers with 'CD-burners' were busy transferring the set from pristine, cleaned LPs using 'state of the art' turntable arms and sound processing but this remained a game for the moneyed few. EMI finally relented last year and announcements of the release of this set were enthusiastically greeted. Finlandia is mordantly performed: a black wave topped by the craggy abrasion of the trumpets. The woodwind's harmonium-imitative tones must be an evocation of Sibelius's prentice works which included that domestic instrument. The riptide trumpet fanfares are at first so rushed as to wrong-foot the Hallé players but only the once. The throaty horns are on their metaphorical hindlegs and the big tune is done with a catch in the throat and a burst of the highest voltage. Pohjola's Daughter. This is another symphony in all but name and one of voluptuously overflowing invention and enchantment. The strings shudder smartly. The harp is beautifully captured. The clarinet part is perhaps not as fluid as it might have been. Dynamic contours are excellently captured and many details float clear for the first time. The performance is up there with the Horst Stein recording on Decca. This is apparently much better than Barbirolli's 1959 recording once available on EMI Phoenixa CDM7 63775-2. I noted the urgent wailing screams at 8.20 foreshadowing Bernard Herrmann's bird shrieks in the shower scene from Psycho (1960). This is a very exciting performance fading out to a perfectly judged sombre niente. The following Valse Triste is given a languorous Sospiri of a performance. The Swan of Tuonela features some fine string work in this cor anglais-led soliloquy, off-set by the Lemminkainen's Return. This is a troika ride (a sort of early Nightride and Sunrise) with its bellowing brass so close in spirit to symphonies 1 and 2. It remains a mystery to me why Barbirolli and, for that matter, Berglund, avoided recording Lemminkainen and the Maiden's of Saari and Lemminkainen in Tuonela. The First Symphony is given a stunner of a performance. It is taken at a fair old lick with the icy dazzle of the strings not in the least compromised. It is all very pliably and lovingly done without being at all languid. The Valse Triste steadiness of the second movement is notable - quite slow and with a shiver that chills to the bone. The Scherzo is tensely chiselled - throbbing sharply. The finale is on reins held commandingly in a Mravinsky-like grip - a tungsten-tempered hawser stretched to whip-tight breaking point. This is an electrifying interpretation. Barbirolli knows so well how to pace the emotion - pressing onwards then holding back in classic Tchaikovskian technique. An undoubted highlight of the set. It should come as small surprise that Sibelius often went well in Barbirolli's hands with his Italian heredity and Mediterranean emotionalism. Italy was of great significance to Sibelius (and other Scandinavian composers) being the wellspring for his Second Symphony and for Nightride and Sunrise (the latter regrettably not recorded by Barbirolli). The opposite pole to the First is the Fourth. It is dismally swarthy but mesmerising, relieved by the often loftily pitched strings - hoarsely abrasive and resonant. Comfort comes in the shape of the oboe song in the second movement resounding amid the tundra's permafrost. One can imagine how Barbirolli must have relished the cello solo at the start of the final movement. The recording was made just two months before the conductor's death. Were the composer's thoughts about mortality through throat cancer (reflected in the symphony's overcast mood) also in Barbirolli's mind for this performance? The Second Symphony is so expansive that some may find it less than ideal. It is up against (and must ultimately succumb to) competition from Barbirolli's incandescent berserker-charge of the RPO recording on Chesky. There are however many attractive details. There is the satisfying braying crump of the brass at 6.58 in the first movement. In the second movement at 5.09 the calming woodwind carillon is wonderfully done and one of the advantages of the evolutionary approach. The finale is notable at 5.35 for the blow-torch fury of the violins and the darkly jabbing trombones at 6.38. It is interesting to note that this performance times out at 45.57 whereas the Chesky runs to 43.54. Sanderling's Berlin Classics disc suffers similarly (duration 45.34). In both cases a grand sweep topples over the edge into something close to torpor. The Third's pulse is again slow and in my view this emasculates the propulsive force of the music. Set against this the wonderful woodwind pealing out at the top of the big theme at 6.49 (I). The second movement is thoughtful. The slower pace also pervades the finale with woodwind details registering strongly, more often and with greater poignancy than in other, fleeter, hands. That said, Barbirolli does place the structural core of the symphony under great strain. Barbirolli's way with the fifth is rather slack and fey. I missed the tension of Berglund on Royal Classics (the cycle that supplanted the Barbirolli in the period to 1976) and Collins on Beulah . Soon however the rapid water-lapping tempo asserted at 8.50 onwards begins to convince and to cement impressions. There is a delicious flute flourish at 9.40 in first movement. The Hallé are in snappily powerful form - a major orchestra on-song. In the intermezzo middle movement things fail to cohere and begin to topple and a similar weakness carries over into the finale with the swing of the tolling theme seeming far too relaxed. Time and again, though, the recording's depth and subtlety triumphed e.g. in discreet scuttling of strings at 5.40. I am afraid that the seventh suffers from the same weakening pulse. It cannot match Berglund's Bournemouth version let alone the Mravinsky. In the Pelléas suite we are again treated to a very deliberate pace coupled with an impressive sense of control and concentration. 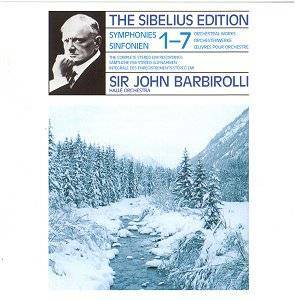 Barbirolli brings out in the second movement parallels with the film music of Bernard Herrmann (himself a champion of Sibelius with the CBS Symphony Orchestra) with one of those cool-as-snow dances over the quiet pulsing of the strings. The whole suite is quiet and low key. With the Scènes Historiques we are back to Barbirolli on top form. The contours are traced and turned with punchy precision fully the equal of the shorter pieces on the first disc of this set. The Hunt, bustling and busy, bears some passing resemblance to the flighty music of Berlioz but the discordant fanfares and the harmonic sharpness of the strings show a family likeness with the Fourth Symphony. The initially untroubled Tchaikovskian Scena soon erupts into patriotic derring-do (and even a hint of bombast) familiar from Finlandia and En Saga. Rakastava (The Lover) is contemporaneous with the superficially forbidding Fourth Symphony. For strings and discreet percussion, this is one of those essays in blanched Nordic atmosphere - a step (or ten) Northwards from Tchaikovsky's Serenade for Strings. The lambent sheets of the aurora borealis shift smoothly and kaleidoscopically while the human drama of love and romance is played out on manicured lawns. This work can loosely be grouped with Sibelius's 'second violin concerto' the Six Humoresques for violin and orchestra. The Romance (1903) is akin to Rakastava although lighter and less memorable. The Sixth Symphony has none of the spotlit grand heroics of the Fifth. It is a work of serenity agreeably dominated by the strings and with melodic material suggestive of the Third Symphony. It is not a work of extremes: subtle but amply accessible although in a different way from the out and out romanticism of symphonies 1 and 2. The Barbirolli approach in this case is classically poised with plenty of passion of the smoothest hallmark. Listen to the furious attack of the strings at the start of the final Allegro Molto! I have heard more driven performances but this time Barbirolli hits what is, for me, the exact right note. This is a cycle for those who love their Sibelius very broad indeed. This has its own satisfactions often capturing details lost in the fleeter approach. This cycle will surprise you with the audacity of its tempi and reward you with 'new discoveries' when you need to freshen your pleasure in Sibelius. Nice to see the original LP covers reproduced on the inside surfaces of the case. Nice packaging as well - artfully squeezing 5 discs into a single double-width jewel case. The finesse and might of the recorded sound is a lasting testament to the work of Christopher Bishop and Christopher Parker and Ronald Kinloch Anderson. Documentation is excellent from Michael Kennedy (Sibelius and Barbirolli - plenty of valuable detail on Barbirolli's life long support for Sibelius) and Stephen Johnson annotating the Sibelius works. EMI Classics are warmly to be congratulated in many respects. A measure of their sensitivity and attention to detail is the generous helping of silence between the works on each disc. If Sibelius's symphonies are as much about the alchemy of light as about the spirits of earth, air, fire and water the speed at which that light travels is slowed in Barbirolli's hands. The youthful edge of impetuosity is moderated overall. This does not usually undermine excitement although that element is certainly shaded somewhat in the Symphonies 2, 3, 5 and 7. Nos 1 and 6 are performances and recordings close to my vision of perfection. This is a recommendable set although not the only one to have on your shelves. The strengths (and these are very considerable) are to be found in symphonies 1, 4 and 6 and the shorter orchestral pieces.